We had a great trip on Friday. The seas were flat calm and the fish were biting. We started out doing some deep jigging for Cobia, Blackfin Tuna, and Amberjacks. We quickly got into some action by catching two pretty Blackfin from 10-15 lbs, good eating for the grill. We then found the Amberjacks and quickly tired ourselves out fighting these beasts, only to watch them get eaten by a couple of 8-9 ft sharks. We picked up and moved a few miles away to find the ocean full of life. There were multiple boats hooked up catching nice citation cobia, but not the first person was trolling. We quickly saw a nice Wahoo sky and put our lines in. We immediately had a mono rig chomped off and caught a nice little Wahoo for the grill. We set back out with all wire and over the next few hours proceeded to slam some nice wahoos, including a nice 50 lb slob. We also lost one around the same size right beside the boat when a tackle failure took place. The fishing off of Wrightsville beach in the Stream will only continue to heat up as the Mahi will begin to move in, the wahoo will become more aggressive, and a possible run of yellowfin could occur in the next few weeks. Call and Book your trip today to get some of this fantastic table fare in your freezer. The weather is starting to get warmer – finally! And the phone is lighting up! Fishing fever is starting to take hold of everyone. While the fishing inshore is still a little slow, Gulf Stream fishing is doing pretty good. A deep jigging trip last week produced 65 plus amber jacks (lost count), African pompanos, and some black fin tuna. The guys were jigging machines and didn’t quit all day. Water temp was still cool for the stream. Jigging started in 325 ft water and worked up to 210 ft water. How exciting and heart pounding! 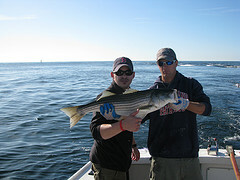 Just a reminder, call and book your fishing trip early! Wahoo fishing is on fire right now! Five were caught, biggest one being 63 lbs, and 4 more were missed. No dolphin were caught that day, couldn’t even get a King Mackerel to bite. Ballyhoo were being pulled, naked and with skirts. The skirts seemed to work the best. The fish were very aggressive coming to the baits and “the bite”. When the other fish begin to shut down in the Cold months from November to February, the local Striper population begin to feed in Downtown Wilmington, NC. These fish range all the way from 3 to 30 lbs and are feisty fighters. Often the coldest, nastiest day you can choose is the day they want to bite, with some ten to fifteen fish days happening every year. There are often several other species that will surprise you during the trip. 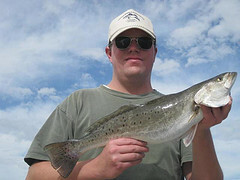 Speckled Trout and Redfish can be found in many of the same spots with the Stripers, a few catfish have even been caught in the brackish water. While the Stripers can not be kept, the Speckled Trout and Redfish can be for some excellent table fare, but catch and release is optional. We catch these fish using two methods, trolling deep diving plugs and casting jigs and swimbaits, which makes it easy for any range of experience to enjoy. Its that time of year again, the cold has set upon us and ice is abundant, but in the middle of this coldness there are a few types of fishing that can warm you up inside and is just down right fun. The speckled trout bite is going good and the fish are a nice size with most being over 16 in. 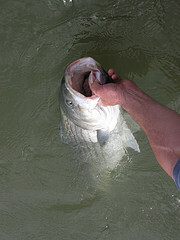 Striped Bass can be caught right beside the trout, with the stripers running from 2 lbs. to 15 lbs. There is also a few Redfish around to surprise you as well. The Gulfstream bite will be heating up real soon, with good catches of Wahoo and Tuna coming in January, February, and March. The Grouper fishing will be closed as of the new year but comes back in in March. 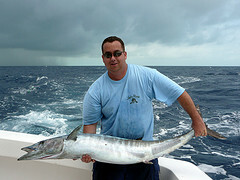 We are now pre-booking all 2010 trips gulf stream, offshore, and near-shore. so call and reserve your spot today. The Striper fishing season will continue through the next few months in the Cape Fear River, with the coldest nastiest days of the year coming up. This fish are still aggressive even in the chilled water and willing to bite in a variety of different ways for all ranges of experience. We can cast jigs and swimbaits for them, A little bit of vertical jigging, and trolling diving lures. The water levels and color have been challenging us lately, but the fish are still very catch-able and will only get better as the water clears up. Room is limited, only two persons per trip. 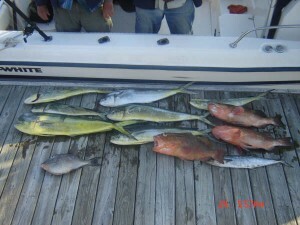 Call 910-622-3474 or 910-617-0777 for prices and availabilities, or visit us online at www.fishcarolinabeach.com. Inshore/Near-shore Fishing Report- Spring fishing is HOT!!! The beach fishing doesn’t get much hotter than right now in terms of shear numbers of fish. The Spanish Mackerel and Bluefish are here, and provide tons of action when the weather is nice enough to break the inlet. The Spanish have been big lately, with many of the fish being over 16 in and a few are mixed in over 5 lbs. Bluefish are found in and around the Spanish schools, and they are also really thick in the Inlet during the morning. They are also nice sized and will tug the line and give you great table fare at the house. A few flounder have moved into the river, but are still few and far between. The trout are present in the river and some are nice sized, but will continue to increase in size and numbers as the month goes on. Black drum and Red Drum are around and can be caught if you set up in the right spot, but have been concentrated in just a few small spots lately. The fishing will continue to improve as we progress towards summer time and get closer to the fall pattern we all crave around here.